Looking to foster that special bond with your child and other families? Start your journey with us at the Parent-Child Center where you will participate in a full range of classes, holiday celebrations, events and more. Below is a list of following programs for families with small children. You are able to register online or by calling our office at 305.538.7231 ext. 238. This is a parent-cooperative program designed to support children as they transition to preschool. Children will learn to make friends, seek help from adults, separate from their parents/caregivers and participate in a preschool style class in a Reggio-inspired environment. The separation portion of the class begins half way through the session. The separation will be gradual, with the parents/caregivers leaving for a few minutes at a time and gradually becoming longer depending on the comfort level of the child and the parents/caregivers. Parents/caregivers are requested to stay in the building during the separation time in case they need to be reached. Additionally, each family is responsible to be the classroom helper and snack provider for a few weeks. The number of weeks as helper will depend on how many people are registered for the class. More detailed information and a signup sheet will be available the first day of class. You are a new parent and delighting in your amazing newborn’s discoveries each day. Lap Babies is a class where you will meet other parents, find solutions to parenting challenges, and share special times with your newborn in a fun-filled setting. We will sing, read, learn massage techniques, and play with our infants all while enjoying opportunities to develop new friendships. Your energetic toddler is on the move and ready to play, play, play! In this class your child will share experiences through sensory, art, circle, and story times. Your toddler will explore and discover through music, art, playground, sensory, and water play while learning and practicing social skills. RIE® encourages basic trust in the child to be an initiator, explorer, and a self-learner in a physically safe, cognitively challenging, and emotionally nurturing environment. Your child will have time for uninterrupted play while adults develop their sensitive observation in order to better understand the babies’ needs. You will read babies cues, learn to intervene and, most importantly, when not to. Lisa Chariff Better is a RIE® Certified Parent-Infant Guidance™ class facilitator. See more at riemiami.com. Music Together® is an internationally recognized, early childhood program based on the philosophy that all children are musical. Tuition includes a beautifully illustrated song book and a CD set. Siblings over 8 months old are 50% off; siblings under 8 months are free (with one paid registration). Music Together® is a registered trademark; Temple Beth Sholom is licensed by Music Together®, LLC. See more at musictogether.com. YogaMusic Dance is a unique class, sharing a new dimension of world music and instruments while exploring new movements with your baby. Bring your baby backpack to use it during class for dances and yoga. Wear loose, comfortable clothes so you’ll be comfortable, and you can bring your own music to share with class. Your baby is beginning to open up to the world, many are already sitting up unassisted, pulling up to standing, maybe even taking their first steps! You and your baby will participate in play-based activities which support cognitive, fine- and gross-motor and social development while learning solutions to common parenting challenges. In this class toddlers will experience the difference between how flour and shaving cream feel between tiny fingers and toes. It will be a place where squeezing an entire bottle of glue onto paper is not only OK…but is strongly encouraged! 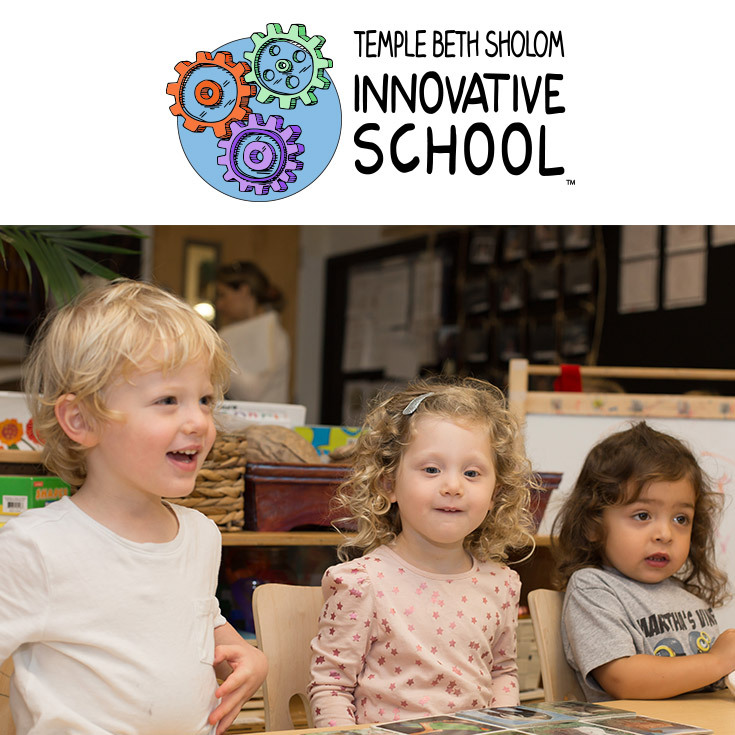 This class will offer multi-sensory, messy and open-ended experiences where children will have the opportunities to strengthen their disposition for curiosity, creativity and co-learning. Children will participate in a broad range of developmentally appropriate experiences and will discover the joys of working with one another through full-bodied arts investigations. Caregivers will develop an understanding for using the arts as a tool for thinking in guiding their young child’s development. A fun-filled class that combines dance movement, exercises, music, rhythms, and beats along with Zumba choreography and broken into kid-friendly routines. A combination of stretching, strengthening, coordination and music for both toddler and caretaker. ZumbaBeats is the perfect recipe for fitness fun that adds age-appropriate games and activities for helping children develop coordination, self-confidence, overcome fears, learn about teamwork, and much more.